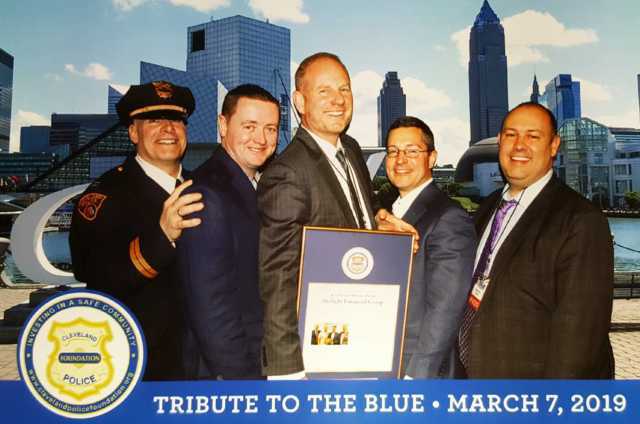 Last month, Skylight’s own Mike Connole, Jonathan Goldston, Mark Owens, and Jeff Zemito attended Cleveland Police Foundation’s Tribute to the Blue. This exciting event benefits the Cleveland Police Foundation, Skylight’s long running community service partner. The night included dinner, drinks, and accolades for those that support community initiatives across the area. Members of the Skylight team were presented with the prestigious Thomas D. Ganley Memorial Community Service Award that evening, recognizing the continued efforts of the Skylight Foundation and its celebrated holiday toy drive. 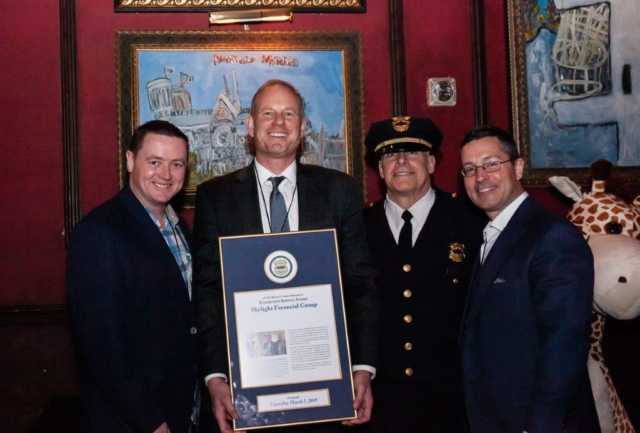 The story of this partnership all started when Mark Owens had the chance to meet Captain Keith Sulzer of the Cleveland Police Department. The two realized that both organizations shared a desire to give back to their communities and decided to team up. As Skylight became more and more involved with the CPD’s Cops for Kids program, the beginnings of the holiday toy drive began to take shape. Four years later, the Skylight Foundation’s holiday toy drive now donates thousands of toys to children and families in need across the state of Ohio. In fact, Skylight’s contributions have been so successful that the Cleveland police now give out toys to those in need all year round, including kids at the MetroHealth Pediatric Unit and beyond. Financial planner Jeff Zemito, the original organizer of Skylight’s holiday toy drive, has worked tirelessly year after year to make this program a success and certainly has a lot to celebrate. In addition to this award, Jeff recently received a $10,000 grant from the MassMutual Foundation to support the mission of the holiday toy drive. For more information on how to get involved with the Cleveland Police Foundation, visit their website.